A Diamond Select Toys release! 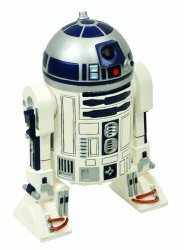 Add the droid that started it all to your collection and start saving the galaxy one coin at a time with this all-new Star Wars R2-D2 Figure Bank! Collectors Note: Comes packaged in a clear polybag.